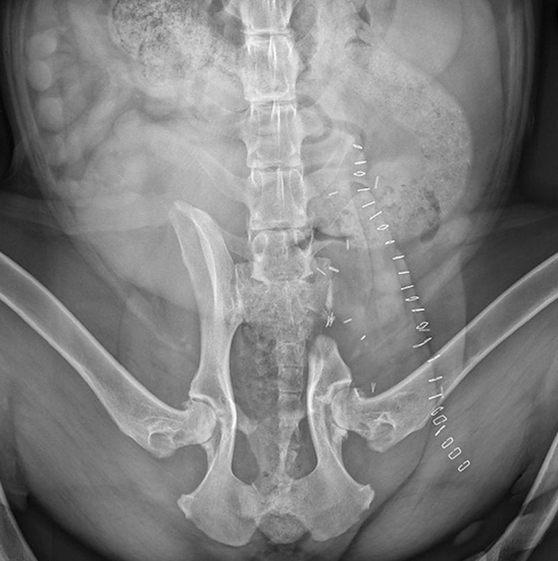 A 10-year-old spayed rottweiler with a 2-week history of left pelvic limb lameness and a palpable mass over the left ilium was referred after fine-needle aspiration findings were consistent with a mesenchymal sarcoma, most likely osteosarcoma. On physical examination, the patient continued to show mild left pelvic limb lameness. There was a 10-to-12cm hard palpable mass overlying the left ilium. The physical examination was otherwise unremarkable. 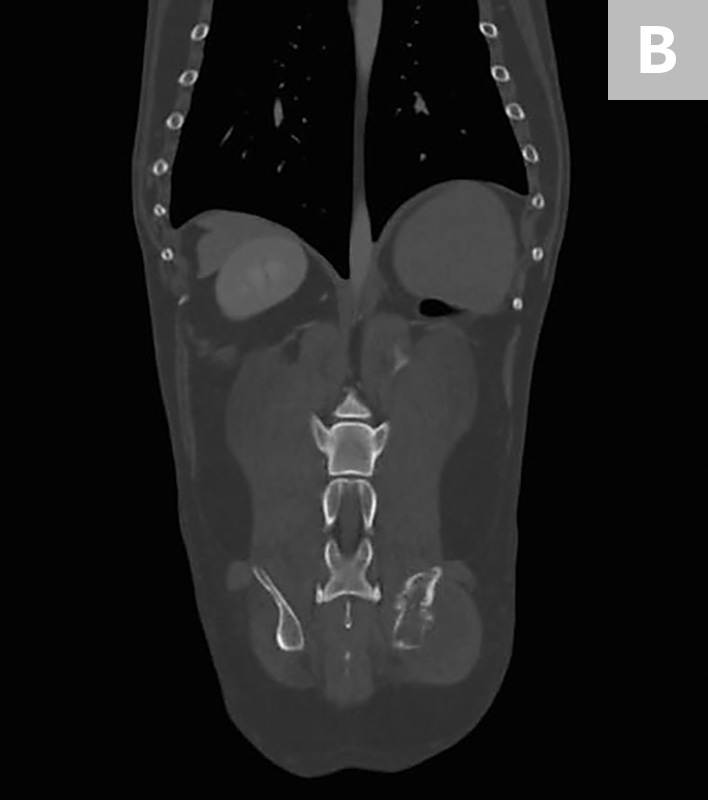 FIGURE 1 Axial (A) and coronal (B) CT images from the patient. 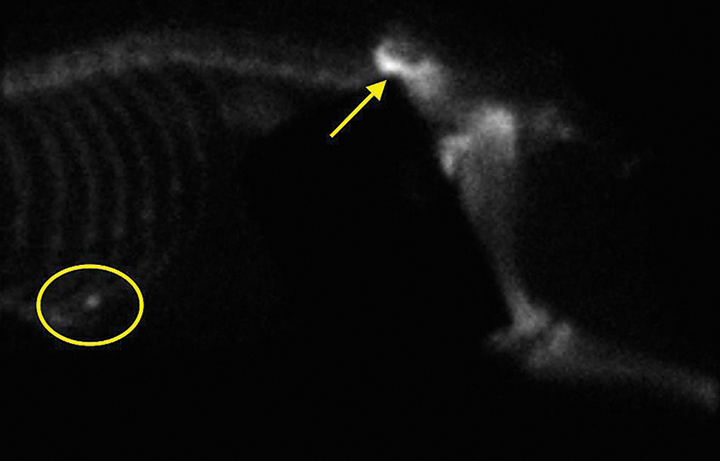 An aggressive bone lesion arising from the left ilium, with extension to the surrounding soft tissues, can be seen. CBC, serum chemistry profile, and urinalysis results were unremarkable. Three-view thoracic radiographs showed no evidence of gross metastatic disease. A CT scan of the chest, abdomen, and pelvis showed an aggressive bone lesion of the left ilium, compatible with osteosarcoma, with tumor extension to the surrounding soft tissue (Figure 1). A full-body bone scan was performed. Static images were obtained 2 hours after intravenous injection of Tc99m-MDP. There was marked uptake in the area of the primary tumor (ie, the left ilium). There was also a possible metastatic lesion in the left costal cartilages; however, careful review of the CT scan showed that the increased uptake of radiopharmaceutical at that site was most likely consistent with old trauma rather than metastatic disease (Figure 2). FIGURE 2 Bone scan image from the patient. 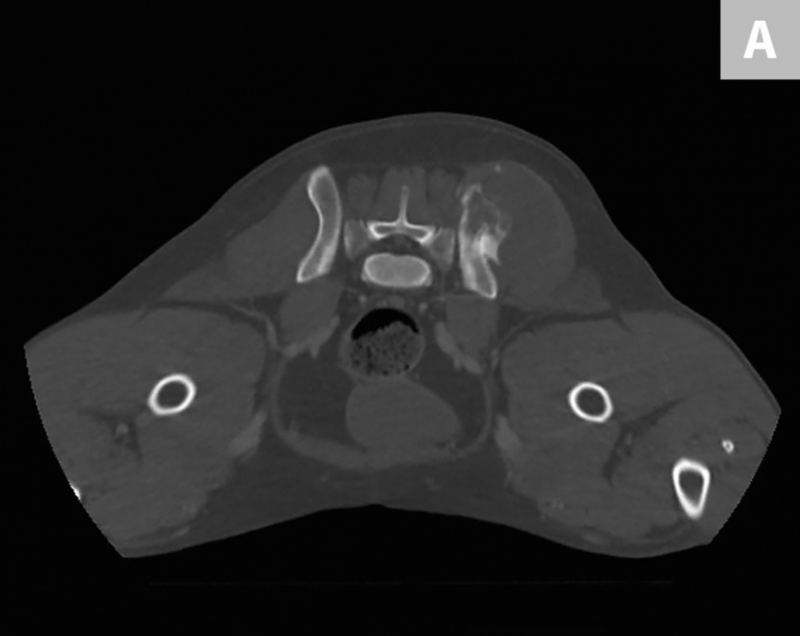 Increased uptake of radiopharmaceutical in the left ilium (arrow) and a potential lesion in the left costal cartilage (oval) can be noted. Left ileectomy and stereotactic radiosurgery were suggested to provide curative-intent local control of the tumor. Palliative radiation was also discussed. 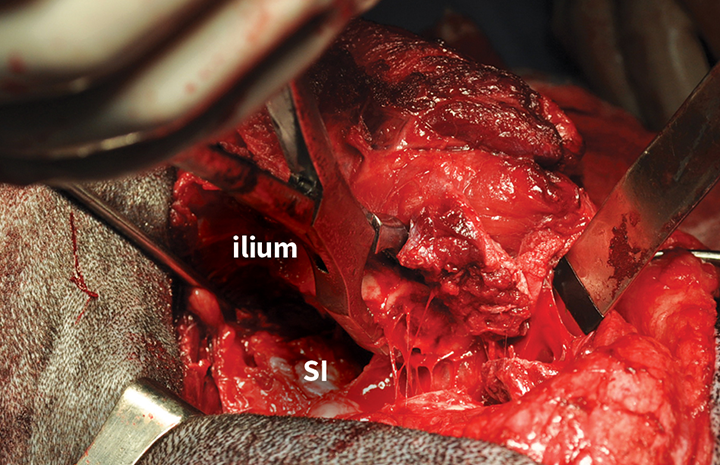 The owners elected ileectomy and preservation of the left pelvic limb; the left ilium was resected via sacroiliac disarticulation (Figure 3), and the left acetabulum and left pelvic limb were preserved. Postoperative radiographs showed adequate tumor removal (Figure 4). FIGURE 3 Intraoperative image of ileectomy. The osteotomized ilium is grasped with bone-holding forceps after disarticulation of the sacroiliac joint. The exposed left sacroiliac joint is visible at the level of the sacrum (SI). The patient recovered well from surgery in the intensive care unit. She was managed postoperatively with fentanyl (2-5 g/kg/hr CRI) and meloxicam (0.1 mg/kg IV q24h). 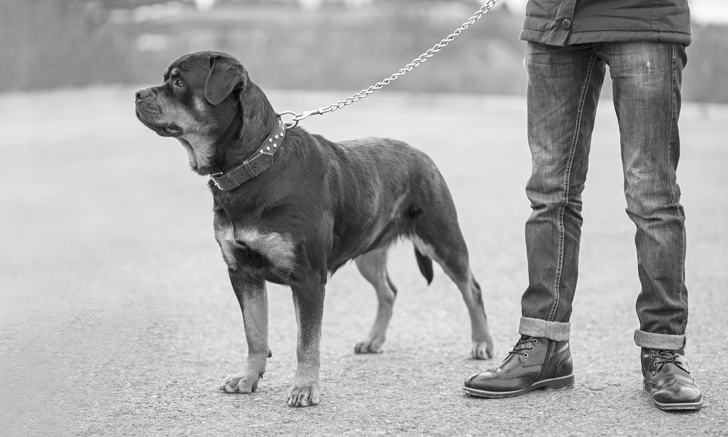 The dog was walking well with minimal support within 24 hours and was discharged 48 hours postoperatively on meloxicam (0.1 mg/kg PO q24h) and tramadol (3 mg/kg PO q8-12h). The specimen was inked to assess the margins and submitted for histopathology. Histopathology confirmed a diagnosis of osteosarcoma. The mitotic index was 32 mitotic figures per 10 high-power (400) fields, with moderate-to-marked anisocytosis and anisokaryosis. The margins of excision were complete. Chemotherapy with single-agent carboplatin (6 doses at 300 mg/m2 IV) was initiated and was well tolerated without complication. At 136 days postsurgery, the patient showed no evidence of local recurrence or metastatic disease on pelvic and thoracic radiographs, respectively, and was ambulating well (see Video).